Women who undergo routine mammograms at United Regional now have the latest screening and diagnostic technology available to them. Finding cancer in its earliest stages provides the best chances of surviving the disease. Until now, the best way to do that has been with digital mammography. While digital mammography is still one of the most advanced technologies available today, it is only a two-dimensional picture of the breast. Since the breast is composed of pockets of dense tissue surrounded by fat, when x-rayed, it creates an image that looks something like a smoky haze. The overlapping tissue in the image makes it difficult to see tiny “spots,” called microcalcifications, and other subtle signs of early cancer. 3D Mammography, often referred to as breast tomosynthesis, uses high-powered computing to convert digital breast images into a stack of very thin layers or “slices”— building what is essentially a “3-dimensional mammogram.” During the exam, the X-ray arm sweeps in a slight arc over the breast, taking multiple breast images in just seconds. A computer then produces a 3D image of breast tissue in one millimeter layers allowing the radiologist to see breast tissue detail in a way never before possible. Instead of viewing all the complexities of breast tissue in a flat image, the doctor can examine the tissue a millimeter at a time. Fine details are more clearly visible, no longer hidden by the tissue above and below. This technology helps radiologists find very small cancers and rule out “false positives,” reducing the number of women who are called back for a diagnostic mammogram. It is especially helpful in detecting cancers in dense breast tissue, which 80% of women have. There are more than 8,000 breast cancer screening sites in the U.S. Nearly 5,000 have at least one digital mammography system. Less than 100 have installed this newest generation of digital mammography equipment, according to Hologic, the company who developed this technology. This 3D mammography unit offers exceptionally sharp breast images, an advanced ergonomic design providing more patient comfort, and the ability to deliver superior screening and diagnostic performance. 3D Mammography is a revolutionary technology that gives radiologists the ability to identify and characterize individual breast structures without the confusion of overlapping tissue. During a 3D exam, multiple, low-dose images of the breast are acquired at different angles. These images are then used to produce a series of one-millimeter thick slices that can be viewed as a 3D reconstruction of the breast. By offering women the latest technology in mammography, United Regional hopes to increase the number of area women who will be routinely screened. In 2011, United Regional performed over 5,200 mammograms. Breast cancer is the second leading cause of cancer death among women, exceeded only by lung cancer. Statistics indicate that one in eight women will develop breast cancer sometime in her lifetime. The stage at which breast cancer is detected influences a woman’s chance of survival. If detected early, the five-year survival rate is 97 percent. United Regional is committed to the fight against breast cancer. 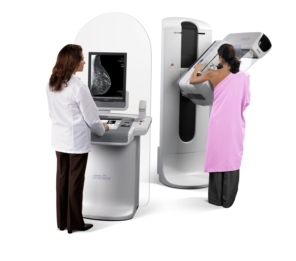 In offering 3D Mammography, we provide the latest in imaging quality. If you would like to schedule a mammogram or have questions about this important breast health procedure, please contact call 940-764-5050.